This day was billed on our cruise itinerary as "Berlin," even though it is a good three hour trek to Berlin from the German coast. Having spent a wonderful four-day weekend in Berlin with Chris' parents, we decided to stay closer to the port and explore two towns nearby. The first we decided to see was Rostock. It was a short walk and a simple train ride to Rostock from the port town of Warnemünde. We got off at the main train station and decided to walk into the town center and enjoy the lovely German summer morning weather. 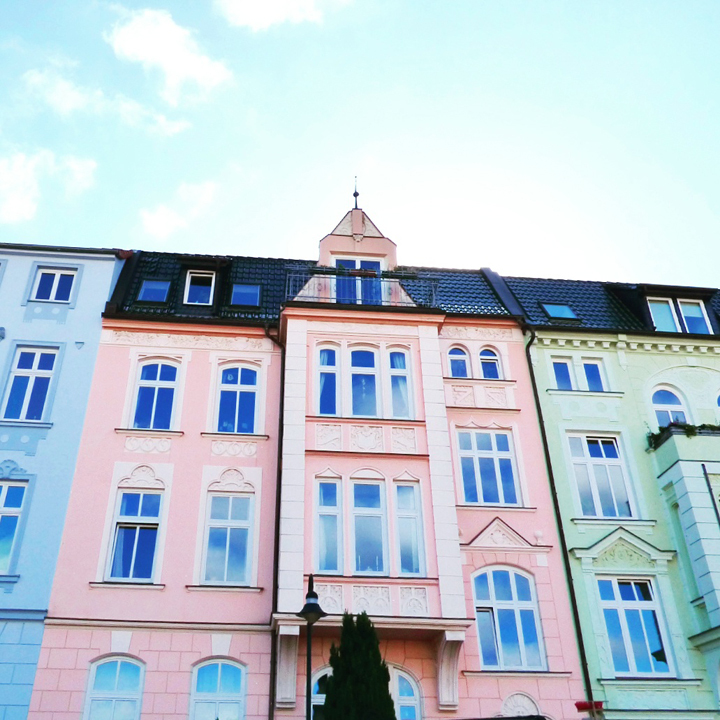 We saw these pastel houses as we walked to the local Edeka to stock up on essentials. Then it was time to start our sight seeing. Rostock is a regional capital with sprawling industrial ports and a tidy Old Town which cluster along the Warnow River about nine miles inland from the sea. Back in Hanseatic times, Rostock was an important shipping and shipbuilding town. Unfortunately, the mid-20th century dealt the town a devastating one-two punch: first it was leveled by WWII bombs because it had several important aircraft factories, and second, in the postwar era it fell on the eastern side of the Iron Curtain and the Communists did a questionable job of rebuilding the city. That said, the city does have some worthwhile attractions. We approached the city at the Stone Gate. Admiring the city scape as we walked. At the Edeka, Jane picked out a toy camera and had fun "taking pictures" all day. I had to get one of her snapping a picture of me. Like mother, like daughter, and I love it so. Just down from the Stone Gate is the Neuer Markt, the New Market Square. This is the city's general gathering point and is an striking combination of beautiful historic buildings and blah communist-era construction. We found a spot filled with the beautiful historic buildings and got a stroller selfie. Here's the Evans Family in Rostock, Germany on Wednesday, August 5th 2015. The pretty pink town hall sits on the square. It has some sort of red brick and black tile addition on top. I wonder what the story is behind that. Some nicely restored merchant homes on the square. Could almost be Amsterdam with gables as good as these. Also on the square is the big, hulking St. Mary's Church. Dating from the 14th century, this is Rostock's main church. It had a very multi-color brick exterior. Inside, this Gothic church is tall, white, and spacious - classic Lutheran. The pièce de resistance of the interior is the gorgeously decorated Baroque organ (on the left). 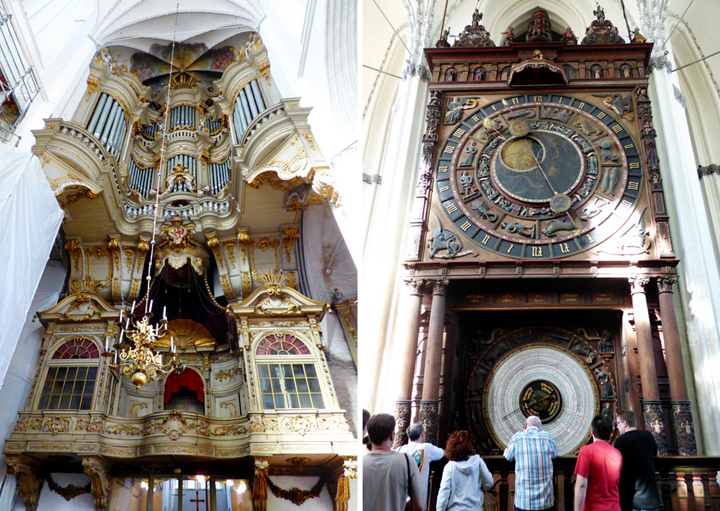 Another highlight is the intricately detailed astronomical clock (right). Built in 1472, it supposedly still has all of its working parts. The upper dial tells the time and the sign of the Zodiac, while the lower dial (pictured below) lists the Saint's day and pinpoints the date Easter will fall on each year. Super cool. Leaving the church we walked down Kröpelinerstrasse, a trendy pedestrian drag with delectable eateries. Only two blocks down Kröpelinerstrasse is University Square. The centerpiece Fountain of Joy is a communist-era creation which displays an unusual (for the time) lightheartedness. Behind the fountain is the university headquarters. I always love seeing these stores around Europe. Love ya Dald! After enjoying University Square, we walked a couple more blocks on the same pedestrian drag and reached Kröpelin Gate. This is one of two surviving watchtowers (along with Stone Gate we saw at the beginning) from the old city wall. Nearby is a surviving stretch of the original town wall. Another shot of University Square as we headed back up Kröpelinerstrasse looking for lunch. And we found some! Legit pulled pork! In Germany! Nooice. I heard the guy explaining what it was to other people so I guess pulled pork is a new concept here. It was a wonderful taste of home and I loved every bite. We moseyed around some more and then decided to catch the train back to Warnemünde and rest for a bit on our boat. And that was our day in charming Rostock, Germany. Coming up next: our date night in Warnemünde, Germany. Both of our posts mentioned the pink Town Hall building (haha, what's up with that, right!? )....I remember we hung out at the university square and watched the kids playing with water. I had fun shopping there, too. Thanks for sharing and help me re-live the fond memories!